There's nothing like a trip to Ikea on a Saturday afternoon to put the final nail in the coffin of a relationship. 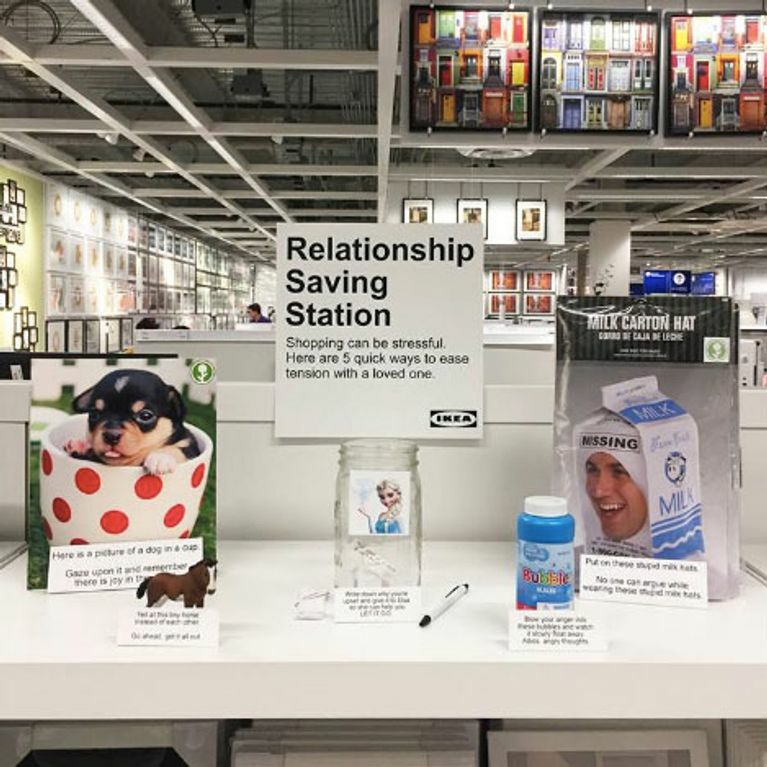 Luckily, comedian Jeff Wysaski snuck into the Swedish furniture shop - AKA hell on earth - and installed a 'Relationship Saving Station' to rescue all newly co-habiting men and women from the inevitable. Jeff Wysaski: relationship saviour. Or at least that's what he'll be known as from now on after he went into his local Ikea and erected a Relationship Saving Station. See, Jeff knows what's up. Jeff knows Ikea is the worst place on earth. A giant blue monolith that holds crying children, arguing adults, a million different cushions in slightly different shades of blue hostage. And let's get real here, there's some situations that Swedish meatballs just can't fix - namely a mile-long queue to the tills. Your first trip to Ikea as a couple will end up revealing your true selves and that can make or break a relationship. Didn't think your boyfriend was one to care about the difference between a birch and pine finish on the kitchen cupboards? Well, all secrets come out at Ikea. Jeff Wysaski, who goes by @obviousplant_ on Twitter, knows this, which is why the comedian's relationship station is a godsend to all furniture shoppers. Wysaski, who is known for sneaking weird and wonderful fake signs into shops, included in his Relationship Saving Station: a tiny horse to yell at, a picture of a tiny dog in a cup to stare at adoringly, an Agony Elsa jar to put all your couple grievances in, milk carton hats (because no one can argue with a milk carton hat on) and bubbles to blow away your anger. It's a strange feeling when you realise that someone understands you and all your needs, isn't it? 12 Relationship Thought Attacks We Need To Get Over STAT!